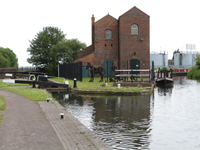 First up are the six locks that were opened in 1837 to access local coal mines and restored in 1974, sometimes referred to as the Crow Flight. Thomas Clayton was based at the bottom of the locks, their boats collected tar and creosote, gas works by-products, and carried them to the nearby Midland Tar Distillers. Fuel oil products from Stanlow were also taken up the locks to the Shell depot next to Langley Maltings until a pipeline was built in the mid-1950s. The landscape is still industrial, a tyre recycling plant to your left followed by large tanks selling red diesel, but perhaps an improvement to when it was adjacent to huge chemical works expelling fumes into the air and effluent in the water. The Tat Bank or Spon Lane Branch leaves to the left, originally designed by Telford as a feeder canal to relieve the Smethwick Summit, it goes to the Edgbaston Reservoir. Going under the disused Oldbury – Langley Green railway line, you get to the disused Langley Maltings, Grade II and derelict. Closed in 2006, and attacked by arsonists, it was saved from being bulldozed by English Heritage and the Victorian Society. More dereliction follows but generally the outlook improves as you make your way to the Navigation pub, and Jarvis Bridge carrying the Wolverhampton New Road which was a project to ease unemployment and opened by the future King Edward VIII in 1927.